We appreciate all that the Federation has done for our family and making it possible to attend Hebrew and religious school. We love when the kids come home singing Hebrew songs or bring back an art project that they have worked on. Last year our son made a menorah that we will use each year for Chanukah. We put up the many mezuzahs throughout our house that they have decorated so nicely. Thank you again for helping us to make a Jewish education possible for our children. What a blessing for these children, but also for the family who gets to give. By making this legacy gift during their life this family is able to see their direct impact on our community every single year. They have told me that they are also pleased to know that their gift will continue to support Jewish education even after they are no longer here. Here in Cincinnati’s Jewish community, our friends and donors are beginning to understand not only the personal and financial benefits of their legacy gifts; they are beginning to see the actual changes in our community. Through the Create Your Jewish Legacy program and through ongoing conversations people from our many agencies, organizations, and synagogues are having; we as a community are beginning to appreciate that establishing legacy gifts has lasting, powerful effects on our community’s future. So it is not surprising that our community’s legacy gifts are growing. There are so many ways both small and large to make a gift materialize. Through a gift in their will, many people make a distribution that initiates a fund; while others get started during their lives and build up the fund over time. Many have also started their funds now, excited by the energy of the Create Your Jewish Legacy program, and have said they will add to them later through their wills, or designations from their IRA or life insurance. Our development team at the Jewish Federation can easily help you with the how. Let’s look at the frequently less-examined question: why. Why do people choose to make legacy gifts to a charity? It depends on their objectives. Personal satisfaction: Making a real difference by doing something important and lasting is highly satisfying. Strengthening the community: An annual payout from a legacy gift eases some financial pressure on our agencies and organizations. Having a strong endowment either at the Jewish Federation or with an organization that one feels close to improves their future financial stability. Continue an annual gift: Some friends and donors recognize that their regular gift each year will be missed once it can no longer be made. To continue the annual gift, they create a fund that is 20 to 25 times the amount they currently give each year to the agency, organization, or synagogue. For example, a couple who gives $1,000 annually can endow this contribution by making a one-time gift of $20,000 to $25,000. Once the organization invests the gift, it can then—every year—take out a small percentage equal to the couple’s original annual gift. Permanence: Many donors see a connection between their retirement fund and legacy or endowment funds. Both are protected and managed separately, so the principal is retained for a specific purpose. Our endowment at the Jewish Federation and at some of our local organizations is managed like a retirement account, providing needed income in a predictable way. Some of our donors even designate unused retirement money to our endowment. As a friend of mine said recently, “Philanthropy is not reserved for the wealthy. We are all responsible for the future of our community.” To learn more about our endowments or our Create your Jewish Legacy program feel free to call or email us. We are happy to answer any questions about how or why to leave a legacy gift. You can reach Deb Steinbuch, Manager, Planned Giving, Endowments, and Create Your Jewish Legacy, at 513-985-1593 or dsteinbuch@jfedcin.org. You can reach the Federation’s Create Your Jewish Legacy team here and the Create Your Jewish Legacy website here. What’s the best way to give back? 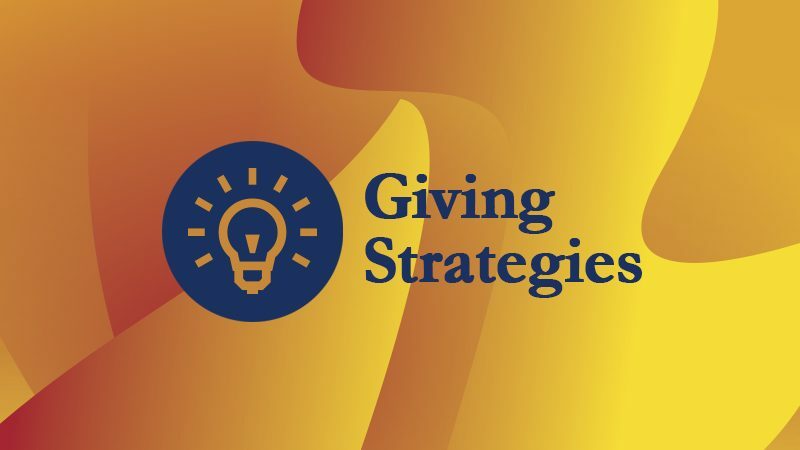 Our Giving Strategies Library offers smart, practical giving strategies show you how. The Jewish Federation of Cincinnati: We look at the whole picture, taking into account the diverse needs of the entire community. Together we can do almost anything. Jackie Congedo Jackie Congedo is the Director of the Jewish Community Relations Council. Jaynie Levinson Jaynie Levinson works to create networking and engagement opportunities that attract and retain Jewish young adults in Cincinnati. Copyright © 2015 Jewish Federation of Cincinnati. All Rights Reserved.